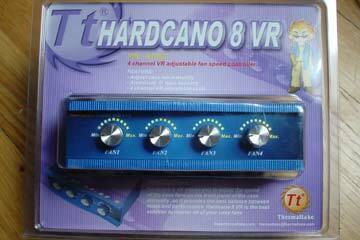 Today we will be taking a look at the Hardcano 8 VR by ThermalTake. 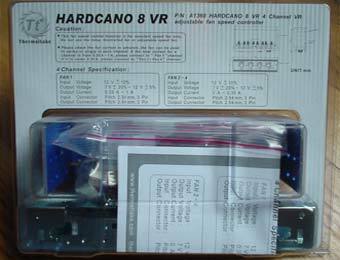 Basically, the Hardcano 8 VR boils down into a basic rheobay that sits inside a 5.25" slot and controls fan speed. This model, like most rheobays, is capable of controlling 4 fans at one time. Why they call it the "8 VR" is anyone's guess. On the back of the packaging, there is a brief explanation of the capabilities of the unit, along with simple hookup instructions.